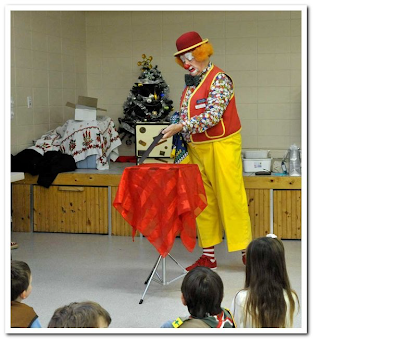 On Sunday December 11, 2011 at the Britannia - Youngstown Community Hall about 25 kids enjoyed a sleigh ride, Shriner Clowns, games and crafts, and a visit from Santa. 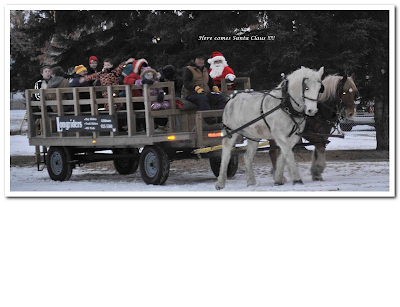 This year one sleigh ride was with Mr Claus himself. Thank you to Opt.Marion & Warren (plus Opti kid Kelly) for the crafts and g ame s , Opt Samantha and Keivin for purchasing food, Opt Samantha, Opt Ruby and Opt John for making hotdogs, coffee, tea and hot chocolate. Thank you to Opt Beryl who was at the gingerbread station and for helping Santa with gifts and of course Opt Clint as the man in red. Opt Brian and Opt Keivin rotated on sleigh duty. Opt Helen and Opt Geneva ran the fishing pond and Opt Eric was our photographer. Lots of parents and grandparents attended making this a great children’s party.